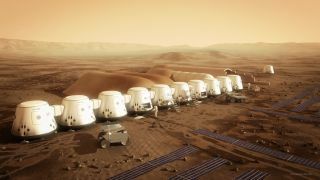 The private colonization project Mars One has pushed its planned launch of the first humans toward the Red Planet back by two years, to 2026. The delay was necessitated by a lack of investment funding, which has slowed work on a robotic precursor mission that Mars One had wanted to send toward the Red Planet in 2018, Mars One CEO Bas Lansdorp said in a new video posted today (March 19). "We had a very successful investment round in 2013 that has financed all the things that we have done up to now. And we have actually come to an agreement with a consortium of investors late last year for a much bigger round of investments. Unfortunately, the paperwork of that deal is taking much longer than we expected," Lansdorp said in the video. "I now think that it will be done before the summer of this year. That means that we will not be in time to finance the follow-up study that Lockheed Martin needs to do for our first unmanned mission in 2018, which unfortunately means that we will have to delay that mission to 2020," he added. "Delaying our first unmanned mission by two years also means that all the other missions will move by the same period of time, having our first human landing now planned for 2027." The new video was apparently made in response to an article critical of Mars One that Matter posted earlier this week. In the article, astrophysicist Joseph Roche, a former Mars One astronaut candidate, alleges that the organization has been picking its astronauts at least partly based on how much money they donate to the private colonization effort. Roche also says that Mars One's selection process is flawed and slipshod. Further, article author Elmo Keep alleges that Mars One received just 2,761 applications from prospective Red Planet settlers, not the 202,000 claimed by the organization. Lansdorp disputes these assertions in the video, saying that money has nothing to do with the selection process, and that Mars One's numbers are accurate. "We offered the reporter, the first journalist ever, access to our list of 200,000 applications but she was not interested in that," Lansdorp said. "It seems that she is more interested in writing a sensational article about Mars One than in the truth." "We will bring our candidates together, we will put them through team and individual challenges, there will be much longer interviews and there will be a much bigger selection committee," Lansdorp said. "This is the way we will determine [which candidates] are good enough to enter our training process."